Roulette is one of the most iconic casino games out there, so it’s no surprise it’s so popular on the Web. The little wheel, for all its draw, involves little skill and that’s why many punters enjoy it. Strategy in roulette amounts to winning by choosing the right numbers – all of which is determined by luck – but are there any other strategies players can employ to increase chances of winning at roulette? We explore the possible roulette strategies below. Roulette is so popular because stripped to its most basic form, it’s an incredibly easy game that requires no particular skill or strategy to play. If you are not sure about which bet to place, your easiest option is simply to stick with numbers and bets you’re comfortable with. Everyone has their lucky numbers, or preferred bankroll limit that they don’t generally want to exceed, so make it easy for yourself by sticking to these. The short and sweet of it is there’s no easy or guaranteed way to win in roulette, so you might as well stay within your comfort zone to ensure game play is an entertaining, fun experience. Roulette betting systems and other general tips help ensure you wager bets you’re comfortable with, or at least are more statistically sound in the grander scheme of odds, but otherwise they don’t automatically mean you’re going to win the majority of spins. The most important thing you can remember when playing online roulette is that this is a game of chance, and there’s essentially nothing players can do to influence the outcome of a spin. Don’t get lost in the mathematical mumbo-jumbo or promises of winning systems some players preach; just play, have fun, and stick to the facts (remembering that certain bets are less risky than others) and what you’re comfortable with when deciding which bets to place. Placing a columns/dozens bets is a popular wager for players who like to stick to the safer, traditional side of things. This involves placing a bet on two of the three columns or dozens on the roulette table. A columns/dozens bet is considered an outside bet, and pays out at 2 to 1 odds. Because you’re betting on two lots of numbers, you’re covering two-thirds of the table. As an example, placing a bet of $20 on the first and second columns or dozens will mean your total bet is $40. If the ball lands on one of your two choices, you will lose $20 but win $40 on the winning column or dozen bet, giving you $60 total. Ultimately, if you won, you would walk away with $20 profit. Columns and dozens bets are a nice option to have if you want to cover as many numbers as possible, but, of course, you’re still susceptible to the house spinning a zero or double zero, or a third column or dozen being hit. Every roulette player who loves the game knows the most ideal variation to play for the best odds is European or French roulette. These are the games where the wheel lacks a double-zero and instead only has a single-zero. As a general rule, you should always choose European Roulette over American Roulette when both variants are on offer. While seemingly insignificant to some, the presence of the 00 actually means there’s a 5.26% house edge in American Roulette, where-as single-zero only in European and French roulette caries a 2.70% house edge – much more favourable, and even more so with certain French roulette-only rules. This is another one of the areas where online roulette is beneficial over land based roulette. When playing at a bricks and mortar casino, the casino will often only offer the American Roulette version, as it pays in favour of the house. 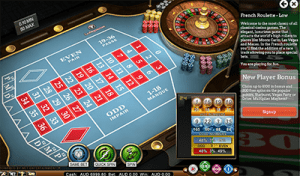 When playing roulette online, the player has the freedom to choose from all the different roulette variants on offer instead of being limited to the less favourable double zero format. You can read our detailed guide about American VS European Roulette here. The la partage and en prison rules are additional rules available only in French Roulette. These two rules apply to 50/50 wagers (outside bets like red and black). La partage gives you half your bet back if the ball lands on zero, and en-prison “imprisons” your wager for the next spin if the ball lands on zero initially. If the second spin matches your bet, you win back your stake, but you lose it if the ball again results in a zero or an outlying number. French Roulette’s unique ‘la partage’ and ‘en prison’ rules are great for all players, but found at limited land-based brick and mortar casinos (aside from European casinos). They are, however, abundant on the Web when playing at leading online casinos. Every real money online roulette player needs to take advantage of these rules when available, as they bring the already lower 2.70% house edge in French roulette down to 1.35%. A great advantage of playing roulette online is that most of the best online casinos offer the option of playing roulette games for free in practice mode. 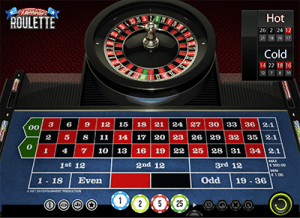 These free roulette games are a great way for you to get your feet wet, familiarising yourself with online play while also having the chance to sample the different types of roulette games on offer. You can dabble between American, European and French roulette with no risk to your wallet to see for yourself how differently the odds can play in favour of the player or the house. While roulette is a very simple game to learn, the betting can take a little getting used to. By playing free games you get practice without risk. Start out betting small and placing the easy bets, like betting on red or black, or on odds or evens. You want to do this for a while so you learn all you can about the game. Roulette is a game of chance, but the more you know about the bets, the better off you will be. You will find an extensive selection of roulette games available at all of our recommended online casinos. For a full list of the top-rated roulette sites catering to players from your country, refer to our casino table listed at the top of this page where you will find detailed reviews of the casino and information about how to take advantage of our exclusive new player welcome bonuses.